Shreveport-Bossier Mardi Gras Pop-Up Party planned for Feb. 9 in the Historic Downtown Plano Arts District will include live music, gumbo, king cake samples, door prizes, and more. The Shreveport-Bossier Mardi Gras Pop-Up Party will bring a taste of Carnival season in Northwest Louisiana to Plano, Texas on Feb. 9. Photo by Casey Habich. Shreveport-Bossier’s biggest parade weekends are Feb. 22-24 and March 1-3. The Shreveport-Bossier Convention and Tourist Bureau, in partnership with event1013 and the Historic Downtown Plano Arts District, will host the Shreveport-Bossier Mardi Gras Pop-Up Party, 7-10 p.m., Saturday, Feb. 9 at event1013 in Plano, Texas. The free party will include live music by Louisiana Music Prize-winning dance band Tipsey, free gumbo prepared by Chef Henry Griffin of Creole Café and Catering in Shreveport, king cake samples from three Shreveport-Bossier bakeries, a cash bar, door prizes, and more. Members of Shreveport-Bossier’s Mardi Gras royalty, dressed in elaborate Carnival season attire, will be in attendance. Complete party information may be found online at http://www.ShreveportMardiGras.com. The purpose of the Shreveport-Bossier Mardi Gras Pop-Up Party is to give Louisiana's neighbors in Texas a fun, free taste of Carnival season in Northwest Louisiana. Shreveport-Bossier’s biggest parade weekends are Feb. 22-24 and March 1-3, but Mardi Gras parties, parades, and events are already underway. Shreveport-Bossier’s Carnival season celebrations offer a variety of experiences ranging from smaller, neighborhood parades to the giant Krewe of Centaur and Krewe of Gemini parades, which are attended by an estimated total of more than half a million parade-goers each year. 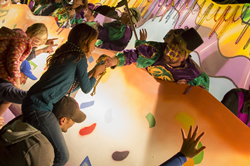 One lucky attendee at the Shreveport-Bossier Mardi Gras Pop-Up Party will win the once-in-a-lifetime opportunity for the winner and a guest to ride aboard a float in the enormous Krewe of Highland Parade on Sunday, March 3. To claim this prize, the winner must be 21 years of age or older. This giveaway may also be entered online at http://www.ShreveportMardiGras.com. The Shreveport-Bossier Convention and Tourist Bureau produces an annual printed brochure called The Gris Gris Guide to Mardi Gras in Shreveport-Bossier. Free copies of this colorful guide, which includes a Carnival season calendar or events, may be picked up at the Shreveport-Bossier Mardi Gras Pop-Up Party. The guide may also be requested by mail by calling 1-800-551-8682. For more information on planning a trip to Shreveport-Bossier, inclusing information on hotels, casinos, restaurants, and attractions, visit http://www.Shreveport-Bossier.org or call 1-800-551-8682.